I think this will be my final addition to this short series. I have yet to learn of the "3 varieties" noted in KM. There are now a total of 4 examples in the Moneta Museum, and they are all different. SO I'm still waiting for anyone who can describe the 3 types. Please comment below and see my other Hofer examples, including various types of One Kreutzers. 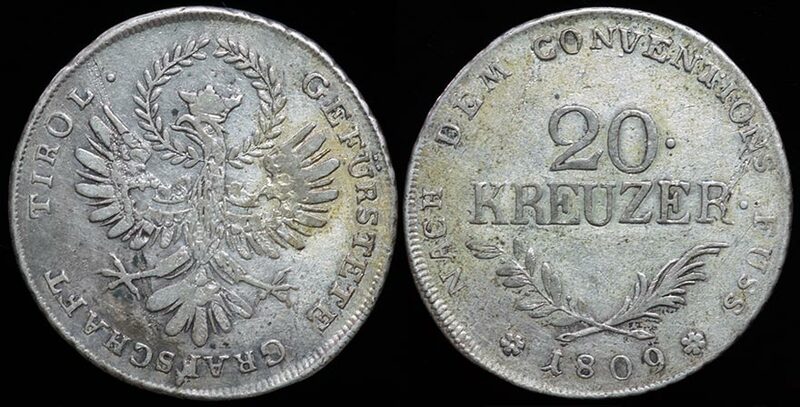 Here is a link to a comprehensive history of the 1809 Tyrolean Insurrection and coinage legacy: For my history of Andreas Hofer and his Rebellion coins: please email martinj481@gmail.com - I'll email the illustrated file.